I know, yesterday I gave you my favorite asparagus, that classic harbinger of spring, and today I'm back with the ugly step-child of winter, the celery root. But if spring is in part about the oscillation between winter and summer, the sequence doesn't seem so out of place. 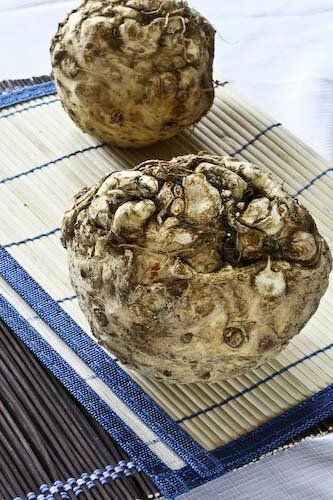 Besides, although the celery root might look like the troll banished from the kingdom where those beautiful pears must live, its taste is surprisingly fresh. And it's not at all difficult to deal with. Plus, it's one way of giving celery its due, of promoting it from its usual role as supporting actress, since the flavor of the root is very much like that of the stalks, only magnified. 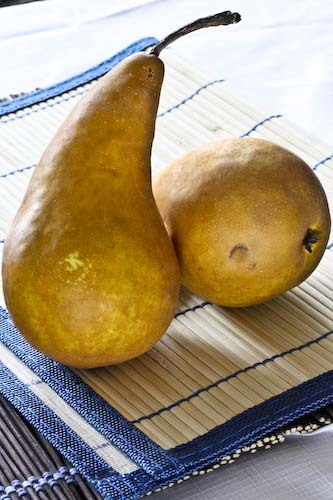 The pears, caramelized in honey and finished with balsamic vinegar, really add a specialness to the dish that belies its homely roots. 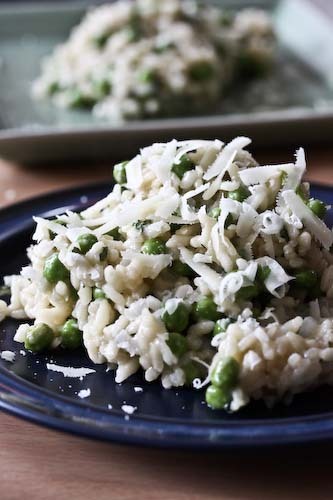 In fact, although you start with such basic, and in one case ugly, ingredients, what you get ends up being elegant and refined. And assuming you're comfortable chopping a few vegetables, this is not the most time-consuming soup I've ever made, although there is a bit more involved than just opening cans. We both loved it, even R gave it the thumbs up. Which is saying something, because he professes to hate both warm fruit (huh?) and puréed soups (double huh?). Proving once more, why it's a good thing I never really listen. 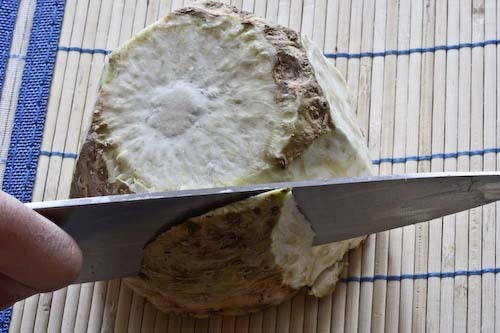 To cut your celery root, simply take a sharp chef's knife (or, if you're like me, a rather dull chef's knife in desperate need of sharpening, but do that at your own risk) and slice off the knotted end, as well as a bit of the opposite end so you have two flat ends. Stand the root on one of these ends and cut away the remaining skin. Then, simply chop the white flesh inside. Melt the butter in a dutch oven or another heavy-bottomed pot over medium heat and add the onion, celery and leek. Sauté for about 6 minutes, until softened but not browned. Add the garlic and cook for an additional minute. Next, add the celery root, the potato, one of the pears and the chicken stock. To this, add the bouquet garni and the reserved green part of the leek. Increase the heat and bring the stock to a boil. Season with salt and pepper, stir, and reduce the heat to a simmer. Cover and cook for 30 minutes, until the vegetables are tender. In the meantime, heat the honey in a small skillet over medium to medium-high heat until it bubbles. 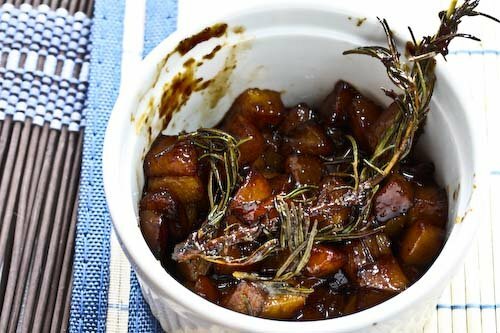 Add the rest of the pear and the sprig of rosemary and stir until the pear is well caramelized and soft. Add the balsamic vinegar and stir until everything is coated, about another 2 minutes. Discard the rosemary and set the pears aside. Purée the soup using your preferred method, either with a blender or food processor or with an immersion blender (my method of choice). Check for seasonings and adjust if needed. 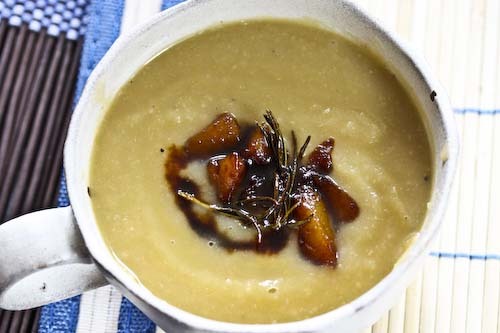 Serve the soup topped with the caramelized pears. Andrea, I love celery roots, though I never really cook them. i only make them for salad. Thanks for sharing the recipe. What a lovely looking soup! I think celery root and fruit pairs beautifully. We recently went to a dinner party where we were served a delicate soup that floated a crouton with kumquat jam on it. I was surprised and then fell in love! I'll have to try yours. Sounds delicious! I adore celery root, and the savory caramelized pears really add something special. The immersion blender is my preferred method of puréeing soups, too. It's actually the only small appliance I have in my kitchen in Paris! I love the flavour combination in this soup! I would never have thought of combining the celery root and pears--what an interesting idea, and I'm sure...just delicious. Wow! wonderful combo. Looks creamy & rich. I love celery root, I just know this soup was delicious. The caramelized pear is a nice touch.